Reorganization plan is due April 15. Wind-down account has $93 million. Professional fees are way over budget. Sears Holdings seems to be "administratively insolvent". Investors are waiting to see how the $35 million payment for releases will be allocated under a reorganization plan. The Ch.11 bankruptcy of Sears Holdings Corp. (OTCPK:OTCPK:SHLDQ) has become even more confusing and chaotic. A reorganization plan is supposed to be filed by the end of the day April 15, but not even their largest creditor, Eddie Lampert, has seen a draft of the plan yet. The company still has not filed their February monthly operating report. Massive professional fee payment requests are being filed with the uncertainty if there is even enough cash to pay them or future fees. Sears Holdings (OldSears) appears to be "administratively insolvent". The parties still are litigating over the terms of the sale of assets to Lampert, and OldSears is spending cash that was collateral securing 2lien debt. The Ch.11 reorganization plan is due April 15. At a hearing on February 14, Judge Drain agreed (docket 2626) to extend the exclusive period to file a plan until April 15 and the exclusive period to solicit acceptance of the plan until June 12. OldSears wanted an extension of time to file a plan until June 12, but the Official Committee of Unsecured Creditors objected (docket 2544) to such a long extension. I have not seen any court filings to request another extension, so either they should be filing a plan by the end of the day on April 15, or they realize a reorganization plan can’t be confirmed anyway and are planning to file some type of non-traditional plan that would allow them to exit Ch.11 by dismissal of the bankruptcy filing. According to a recent court filing (docket 3135) of a letter dated April 9, Lampert’s lawyers state, "ESL also requests a copy of the draft plan of reorganization, which we understand is being provided to other parties in interest and should be provided to ESL as the largest creditor of the Debtors' estates”. So, it seems there is some type of plan being created. I am shocked that as of only a few days prior to the expected filing, OldSears still has not yet consulted their largest creditor on the plan. They need the acceptance (two-thirds dollar amount and majority of claim holders within that class) of at least one creditor class for a plan to be confirmed, plus other standards need to be met. Lampert controls multiple creditor classes. You have to wonder what in the world is going on here. Many SHLDQ investors are waiting to see how the $35 million that Lampert promised to pay for releases will be allocated to specific claim classes, including shareholders, under a Ch.11 reorganization plan. Under sec 1129(a)(9), administrative claims must be paid in full, unless holders agree to a lesser amount, for the court to able to confirm a reorganization plan. There is a way, however, to get around the payment in full of these administrative claims and have the reorganization plan be confirmed, but it is not an easy path to go down. For example, Judge Bernstein, who is a bankruptcy judge in the New York Southern District, confirmed a reorganization plan by Teligent Inc. 282 B.R. 765 (Bankr. S.D.N.Y. 2002). The plan was confirmed even though the company was administratively insolvent and only paid holders of administrative claims pennies on the dollar because none of the 454 holders of these claims insisted on payment in full. Actually, if any would have made the request to paid in full, they mostly likely would have received nothing for recovery because of the extremely poor financial position of the company. OldSears knew for months that it is administratively insolvent. They even had a weekly tracking for this as seen in the table below. They expected to be insolvent by negative $111 million, but they were trying to make some “wishful” thinking adjustments to get this down to a negative $35 million. I am not sure of the status of some of these adjustments, but two of the items actually will most likely be much worse than these February 3 estimates. The $139 million on the above table for 503(b)(9) administrative claims (certain vendor claims) that Lampert/ESL is responsible for paying will most likely be greatly reduced, which means OldSears would have to pay even more of these administrative claims. The amount Lampert pays is being reduced by at least $23 million ($69 million prepaid inventory shortfall at closing less $40 million that would have been paid for severance pay). Lampert is actually asserting the prepaid inventory shortfall was even larger. The other problem is professional fees. The above table had the estimate at $108 million. My current estimate is over $128 million. The total for professional fees/expenses payable after the February 11 sale closing is $73.736 million, not including fees paid to Lazard, based on individual court docket filings. (This total reflects the standard 20% hold on fees.) 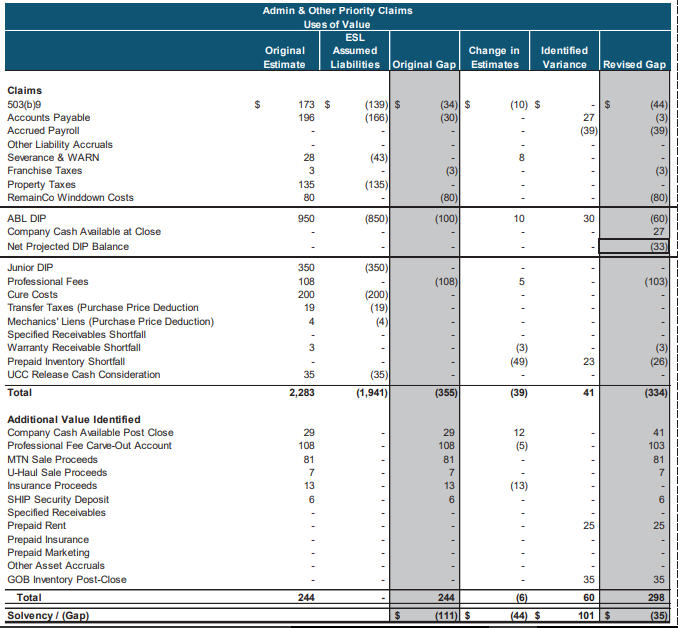 I am estimating an additional $37 million in professional fees and $18 million additional fees for Lazard. The primary reason for the high estimate for additional professional fees is because Weil, Gotshal & Manges (lawyers for OldSears) has only filed for fees up through January 31. Their latest filing for fees/expenses was on April 8 (docket 3084) for $9.498 million for just the month of January. There are many other law firms and financial advisors that are also billing OldSears. How Much Cash Does OldSears Have? Notice how he stated “all cash of the Sellers”. It, therefore, seems that, on February 11, “all cash of the Sellers” was not used to pay the DIP balance. His statement was extremely misleading (I was misled) and should have been qualified to state that it did not include the Wind-down Account cash or any other account that was not included. The monthly operating report (MOR) for February still has not been filed with the U.S. Trustee. I can only assume because of all the litigation over various financial items with OldSears and ESL that it is impossible to create this required monthly filing. When (or if) filed, the cash report will be interesting to see and so will the rest of the balance sheet items after the sale of most of their assets. Lawyers for the 2lien indenture trustee (docket 3050), ESL (docket 3135), and Cyrus Capital (docket 3142) have recently filed documents to support the motion to prohibit OldSears from using 2lien cash collateral. They are asserting that OldSears is using cash from the sale of inventory and other 2lien collateral to pay the huge professional fees the last few weeks instead of using cash from the Wind-down Account. They also assert the value of their collateral has diminished significantly. Really? So, why are the 2lien notes selling at 20? This motion is very late. The cash has been spent already. I spoke to the lawyer for Wilmington Trust and others regarding what is the actual current collateral and value of that collateral behind the 2lien notes. I am not comfortable that there is much specific collateral currently backing these notes. I am also not comfortable relying on payment via a 507(b) claim. It seems some investors may have been confused by two recent news items. First, Sears issued a statement on their old website regarding opening of new smaller stores. Because of how some of the media reported this news, investors may have thought OldSears was opening new stores. Lampert/ESL are opening these stores - not Sears Holdings Corp./SHLDQ/OldSears. The second news item was that Transform Holdco LLC (Lampert/ESL) wants to buy Sears Hometown and Outlet Stores, Inc. (SHOS) for $2.25 per share. This potential offer has nothing directly to do with SHLDQ. This bankruptcy case just keeps getting more chaotic as the process moves forward. For SHLDQ stock and unsecured note investors, the only hope for any recovery is the promised $35 million payment by Lampert for releases. The reorganization plan should, in theory, state how this money will be allocated to various claim classes. The issues regarding potential recoveries for 2lien noteholders are too uncertain to make any rational recommendation. The reorganization plan is due April 15, but if Sears Holdings is administratively insolvent, I have major doubts that plan can be confirmed by the court. A critical hearing is set for April 18 regarding the disagreements over the sale last February and also the use of 2lien cash collateral. There are other items on the agenda that day, but I am not sure if they will all be settled that day.